The Milwaukee Democratic Party (MDP) has dominated the city’s politics during two very different chronological periods—separated by nearly a century. The first dated from the city’s 1846 incorporation through the Civil War and its immediate aftermath. MDP candidates handily bested their Whig opponents in virtually every mayoral, gubernatorial, and presidential contest. They also dominated the Common Council as well as delegations to the Wisconsin legislature and Congress. In 1860, Republican Abraham Lincoln carried four of Milwaukee’s nine wards, whereas Democrat Stephen A. Douglas received 58 percent of the local vote. The MDP continued to be the majority party, albeit by steadily declining margins. The years from 1870 to 1910 featured spirited two-party contests, based largely upon cultural divisions, with the MDP’s strongest support coming from Catholics. In the eight presidential elections between 1880 and 1908, Republicans triumphed in six. The only winning Democratic presidential candidate was Grover Cleveland in 1884 and again in 1892. The only winning Democratic governor was erstwhile mayor George Peck in 1890 and 1892, and even he failed in 1894 and 1904. The most successful Democrat during the period was five-term Mayor David “All the Time Rosy” Rose, whose administrations were so corrupt that he lost to Social Democrat Emil Seidel in 1910. 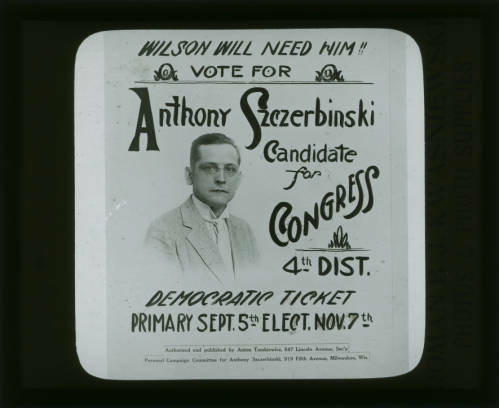 Fearful of the new party in town, the two major parties ran a “fusion” ticket in 1912, aided by 1910 state legislation that mandated non-partisan local elections thereafter. Between 1910 and the mid-1950s, when Milwaukee had a four-party configuration, the MDP was unquestionably the least effectual. Milwaukeeans unsuccessfully opposed Republican presidential candidates Warren G. Harding, Calvin Coolidge, and Herbert Hoover during the 1920s. Ironically, presidential fortunes for Democrats improved markedly during the Great Depression and World War Two, but it still took almost two decades for victories on the national level to trickle down to the local and statewide levels. Although Franklin Roosevelt swept Milwaukee by margins of 68, 78, 64, and 62 percent in presidential elections between 1932 and 1944, the only Wisconsin Democrats elected during the 1930s were Governor Albert Schmedeman and U.S. Senator F. Ryan Duffy. Harry Truman polled 60 percent in his “upset” victory of 1948 but failed to break the Republican stranglehold on state government. While the New Deal coalition catapulted thousands of Democrats into power in other states, in Wisconsin Social Democrats and Progressives typically claimed those prizes. There were no Roosevelt or Truman coattails in Wisconsin. As Democrats achieved near national dominance during World War II and its aftermath, the majority of Social Democrats and Progressives switched allegiances. A “converted” Daniel Hoan ran as a Democrat for governor in 1944 and 1946 while the Progressive Party voted itself out of existence in 1946. Multiple-term Democratic mayors Henry Maier (1960-1988) and John Norquist (1988-2003) entered politics as a “progressive Republican” and a “conservative Socialist,” respectively. Since 1960, every Democratic presidential candidate has swept Milwaukee by victories ranging from 55 to 75 percent. Democratic Senatorial hopefuls have carried the county by an average of two-to-one. Democratic gubernatorial candidates have frequently captured Milwaukee by three-to-one margins, whereas its delegations to the Wisconsin Assembly and Senate have been almost monolithically Democrat. But beneath this apparent Democratic utopia lurk several potential problems: the rivalry between Milwaukee and Madison for control of the state party, the growing population of the suburbs vis-à-vis the city, the increasing tensions among the various ethnic groups within the party coalition, and the ability of Republican-controlled legislatures to gerrymander electoral districts. Buenker, John. “Cream City Electoral Politics: A Play in Four Acts.” In Perspectives on Milwaukee’s Past, edited by Margo Anderson and Victor Greene, 17-47. Urbana, IL: University of Illinois Press, 2009. Fowler, Robert Booth. Wisconsin Votes: An Electoral History. Madison, WI: University of Wisconsin Press, 1976.